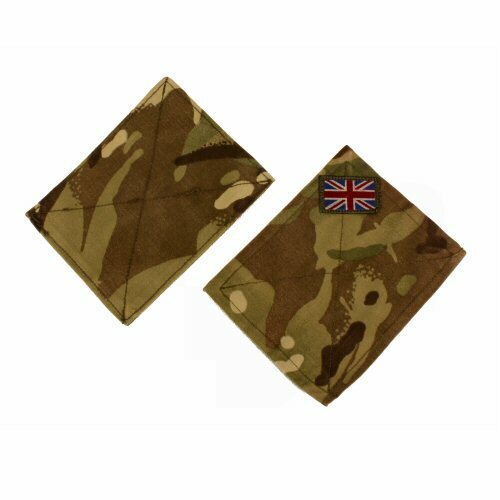 The British MTP PCS blanking patch is a rectangular patched faced with MTP shirt or smock fabric and backed with looped velcro. It measures approximately 10cm x 13cm, to cover the velcro faced arm pockets on PCS shirts, smocks and UBACS shirts. The left patch is blank and the right patch has a small, full colour UK flag sewn at an angle. Unit patches and TRFs can be attached to the panels easily. Also helps to protect the velcro face from burrs, dead vegetation and other dirt, and camouflages away the brown velcro panel on the arms. Sold as a pair.